Technology is always changing, so it’s no surprise there will be some cool new systems to check out in 2019. So far, we’ve seen automated temp and humidity trackers for refrigerators and freezers, ovens that heat to several different temperatures, and automated checklists to ensure side work is completed. There’s even a burger-cooking robot named Flippy making its public debut at CaliBurger in Pasadena, California this year. It can be hard to sift through all of these innovations to find changes you can apply to your restaurants. We’re here to help. The days of ordering at a counter will probably never completely fade, but with kiosks, web, delivery, and mobile options, there are more ways than ever for customers to place their orders. Digital ordering gets better every year, and 2019 will be no different. If you haven’t added kiosks or web/mobile ordering, there’s no better time than now. Restaurant management, as a service, has become a robust industry. Almost every aspect of running a restaurant can be managed by a vendor, from data management to finance to human resources. Depending on the size and configuration of your restaurants, it might be time to find out if there are vendor tools that can make your job easier. What started as trendy gadgets are quickly becoming the industry standard. The Internet of Things is bringing new capabilities to the restaurant industry that can save you time, money, and hassle. Food sensors, in particular, will be big in 2019. Imagine being alerted immediately when your lettuce is wilting, or if the temperature in your cooler is slightly off. A network of cloud-connected food prep devices ensures you’re always serving the freshest foods. If you have a customer loyalty program, 2019 will be a good year (and if you don’t, here’s why you should). Mobile technology can help you integrate your loyalty program with a mobile app, marketing promotions, your digital menu, and more, all while building brand loyalty with your customers. “Big data” has been around for years at this point, but its importance is bigger than ever. By compiling data about what your customers order, when they order it, and more, you can collect valuable insights about what’s working in your restaurants (and what isn’t). Big data can help you decide what items to promote, when to increase staffing, how to lay out your prep lines and dining areas — you name it, and big data can help. Make sure you’re partnering with a business intelligence product that can help develop these insights. That’s a lot to take in. It’s easy to see the potential in these innovations, but remember to ask yourself some important questions: How much of this technology will apply to your QSR? What would the return on investment be? How do you maintain a positive customer service experience with technology taking over more and more of the restaurant management process? These are just some of the questions you should ask before making any sweeping changes to your stores. Some of these questions, you’ll have to answer for yourself, but QSR solution platforms like Delaget can help. 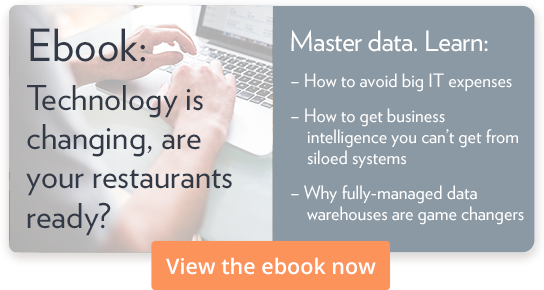 Download our ebook to learn more about how Delaget can help you sort through new technologies to uncover innovations that will help your restaurants thrive.